Should I Refinance After Divorce? Divorce rates have fallen slightly from the oft-quoted 50% reflected by data gathered during the 80s, yet it remains quite possible that a couple once blissfully wedded might decide to part ways. Hopefully this isn’t your situation and you’re just interested in any eventuality, but it’s more likely that you’re here because you’re wondering if you should refinance after divorce. 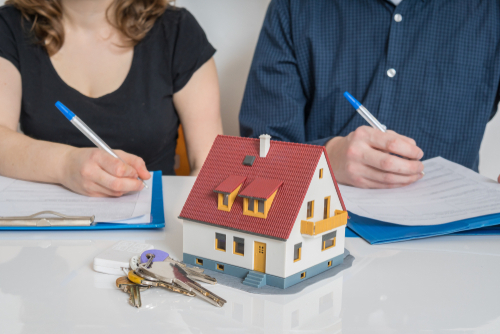 While we aren’t offering legal advice, we do want to share insight into what may make the most sense for homeowners who are divorcing and must decide what to do with their marital home. The way that divorce laws are structured means that even the most amicable divorce is stressful and complicated, and aside from deciding custody issues, this is the issue most likely to spark genuine conflict. Because the marital home is likely a couple’s largest shared asset, it’s vital that each party invest their time and energy into working with their attorneys to find the solution that is most fair and agreeable to both parties. What if my former spouse gets the house? 3. Your ex removes your name from the mortgage. Removing your name from the title only will not absolve you of responsibility in the eyes of the law should your spouse miss payments or make incomplete payments on the mortgage. If your name is on the mortgage, your credit remains at risk for serious, long-term damage. What if I’m the one who is keeping the house? If you’re the party who will be keeping the home, you are most likely going to have to buy out your spouse’s share of the equity. If you refinance your mortgage, you’ll be able to take out part of your equity in cash and use it however you wish—including using it to buy out your spouse, removing any claim they would have had to your home. For example: if you and your ex purchased a home together for $350,000 and the remaining balance now, at the time of your divorce, is $250,000, the difference of $100,000 is considered your shared equity in the home. If the terms of your divorce state that you will be dividing your assets evenly, you would be required to buy out your spouse’s share for $50,000. Now, if you don’t have a suitcase of cash under your bed (or a thriving retirement fund), then using cash from your home’s equity could be a wise way to pay your ex what he or she is owed. Once you have reimbursed your spouse for their share of the equity, your home will be solely yours. 1. Find out your shared home’s current value. 2. Find out the difference between your outstanding mortgage balance and this number. 3. Calculate the percentage you owe your ex based on the divorce terms you’ve agreed to. If you need to find out what your mortgage balance is right now, ask your lender to give you the “payoff” total. This figure must then be weighed against any equity lines of credit that the two of you have taken out, a second mortgage if you have one, or any outstanding debts or liens against your property. This number is your balance. If you don’t need cash to buy out your ex’s portion of the equity, you might still find good reasons to refinance your home after your divorce. You may find that a cash cushion is a great help to you in the first 6 – 12 months following your divorce, or perhaps you’ve been advised that it would be helpful to you over the long-term if you could manage to pay off some high-interest credit cards. Your individual situation will be the most important factor in these decisions, but everyone in this situation should be primarily concerned with protecting their financial health and setting themselves up for success in the future. Divorce is always stressful and in the worst situations it is utterly heartbreaking, but it also presents a rare opportunity to begin your independent life anew. Stay savvy, stay focused, and take the time you require to feel educated about your financial security.